You don't need to be a DIY diva to be able to rework clear glass ornaments into something worthwhile for your Christmas tree. The key to succeeding at these kinds of projects is to make your ornament makeover feel one of a kind and special. To get started, grab some craft glue, purchase an ornament or two, and pick from some of our favorite clear glass ornament ideas. Once you create your favorite, give away your customized ornaments as gifts. Fill a clear glass bulb with greenery and a personalized name card for an easy place setting on your holiday tablescape. 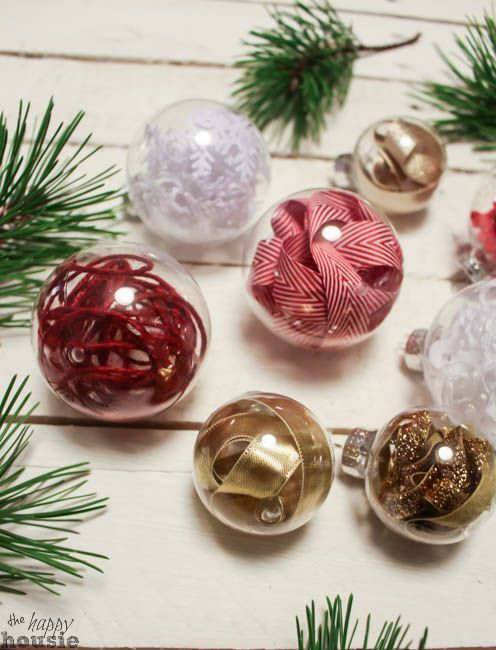 Add an elegant ribbon tie and guests can take these home as party favors to hang on their Christmas trees! Crafting a mini terrarium with clear glass ornaments is easier than you might think. Honestly, there is no green thumb required. However, if an air plant seems beyond your comfort level, you can add in elements like sticks and evergreen branches for a simpler, more festive look. This ornament idea seems like something only an artist can do, but that can't be further from the truth. There's no right or wrong way to create this ornament galaxy. Gather a mini funnel, some glitter and acrylic paint for this glass ornament project. When you start painting your stars, remember to scatter randomly and use different size dots. This clear glass ornament idea is inspired by a ship in a bottle. You can create any type of scene inside your ornament with a little patience and a pair of tweezers. Map out the type of scene you want to create outside ​of your ornament first. Then, using your pliers and some tacky glue, slowly drop your elements into place. The main way to make your ornament a practical gift is to fill it with something the recipient can use. Be sure to wash out your empty ornament first, then include a mix of hot cocoa inside. If you want to create a Christmas tree like an interior designer, incorporate ornaments that work within a color scheme. This ornament idea uses paint and gold leaf to create a variation of ornaments that will work well together on a tree. Mix these ornaments with some gold beading and garland, and your tree will stand out from the crowd. These clear glass ornaments are perfect for families with children. Make a sleek golden ornament with a child's name easily using alphabet stickers from your local craft store. You can also pick stickers in a different color, but just be sure that the filling you use is the same color as the stickers. If you're on a budget and short on time, this ornament idea is perfect. Not only can you create a wide variety of ornaments in minutes, there really is no way you can mess this one up. Gather ribbons of various widths and textures, but try to keep them within a similar color family. Choose two or three colors for the best results. If you want to cover your entire tree with ribbon ornaments, try to mix in different size ornaments as well. Add some sparkle to your holiday decor by filling your clear glass ornaments with sequins. At first glance, it may seem like you need to place each sequin meticulously inside. Actually, all you need to do is coat the inside of the glass ornament with floor wax, then remove the excess. Next, toss in a ton of sequins, put your thumb over the top of the ornament, then shake! These emoji ornaments will resonate with your kids and are really fun to make. You can either fill the ornament with glitter or coat the inside using yellow paint. The original crafter made these emoji face stickers using a Silhouette machine, but you could also hand paint the faces using a stencil.